They have certainly lived up to our expectations, creating great habitat in an eco-friendly way. They practise this in Holland and we wanted a natural system in place to manage the wetlands. The ponies help provide a mixture of fenland and reeds, which provides a much richer wildlife habitat. The ponies have also grazed their way through the reserve’s reedbed, opening up new pools and channels that attract fish and amphibians which, in turn, have provided a banquet for the reserve’s rare and secretive bitterns. A recent insect survey found that the koniks have also helped to provide homes for more than 300 types of beetle on the reserve, including the elusive crucifix ground beetle, which is now so scarce it is now only found in a handful of places in the UK. The ponies have become an attraction in their own right for visitors. “While the horses are feral, they are more friendly and gentle than some other wild horses. We initially had some complaints from bird watchers who felt the horses were disturbing the birds, but that was it. 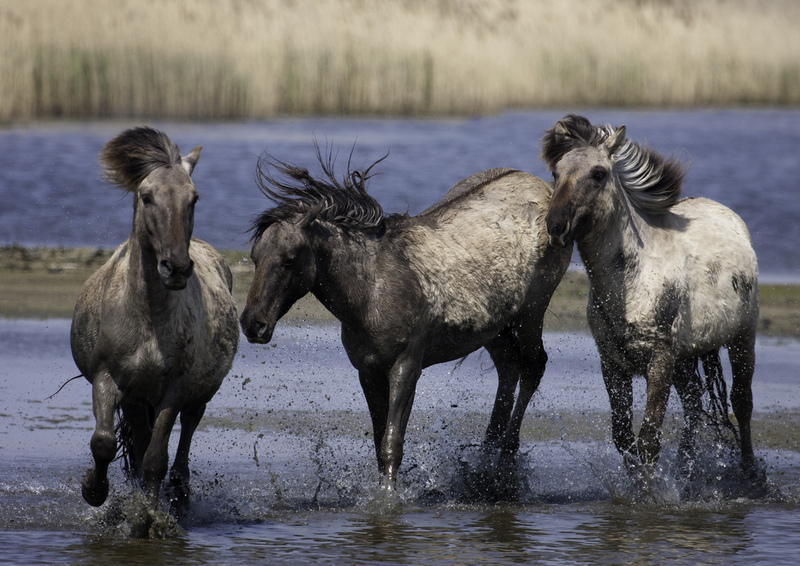 The konik ponies at Blacktoft form part of Back To The Future, a five-year project aimed at restoring local wetlands to their former glory. Wildwood Discovery Park greets first Spring Konik foal; Tuesday’s Horse; 16 April 2012. Nature reserve recruits herd of rare wild horses; Tuesday’s Horse; 7 April 2011.